Welcome to Texas. Everything is bigger and better here, even the history! Come explore the thousands of historical, cultural, and natural treasures in the Lone Star State. We want to enrich your life through history, one visit at a time. Experience the vastness and wonder of the Lone Star State with the Texas Historical Commission’s Texas Heritage Travel Guide and Texas Time Travel Tours mobile app. Highlighting historic destinations that tell the real stories of Texas, use these resources on your next adventure and immerse yourself in the captivating story of Texas. 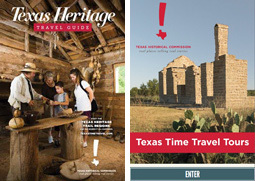 Texas Heritage Travel Guide – Download the free Texas Heritage Travel Guide (PDF) and Travel Guide Map (PDF), or request a printed copy. 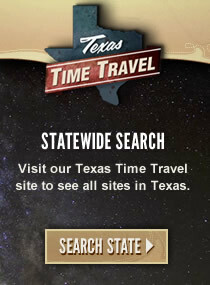 Texas Time Travel Tours – View the mobile tours on the web. Heritage tourists can learn more about the rich Texas history and experience real places and stories at one of the Texas Historical Commission's state historic sites. From whitewashed ruins and Victorian mansions to sacred burial mounds and pivotal battlegrounds, the Texas Historical Commission (THC) state historic sites exemplify a breadth of Texas history. View the 22 historic sites by exploring them on a map to learn more. For a quick guide, download the Set Your Sites on History brochure (PDF). Check out the rental facilities available at some historic sites for your weddings or special events. The THC's award-winning heritage tourism initiative, the Texas Heritage Trails Program, encourages communities, heritage regions, and the state to partner and promote Texas' historic and cultural resources. These successful local preservation efforts increase visitation to cultural and historic sites, bring more dollars to Texas communities, and preserves the state's historic resources for the use, benefit, and enjoyment of future generations. Order print copies of the regional travel guides and thematic travel guides here. Download PDFs of the travel guides here. The Texas Historical Commission, the state agency for historic preservation, administers a variety of programs to preserve the archeological, historical, and cultural resources of Texas. Texas has the largest and most diverse collection of county courthouses in the nation. The nationally recognized Texas Historic Courthouse Preservation Program is in the process of restoring the state’s most treasured historic landmarks. 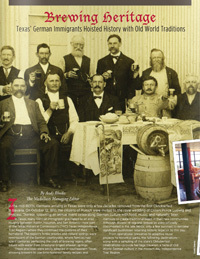 The Texas Historical Commission is a leader in implementing and promoting heritage tourism efforts in Texas. Enrich your life through real places that tell the real stories, one theme at a time. Texas First Lady and honorary chair Anita Perry, in partnership with the THC, is recognizing communities that have shown a high level of creativity and ingenuity in preserving their authentic Texas sense of place. Visitors can stroll the sidewalks and peruse shops in one of the region’s Texas Main Street cities. Partnering with the THC, each community works to revitalize its historic commercial area, often the heart of a town. Explore unique travel destinations in Texas and find travel tips in our archive of travel articles from The Medallion, the THC's quarterly magazine. Texas hosted three confinement sites for enemy aliens, at Crystal City, Kenedy, and Seagoville. In addition, two U.S. Army temporary detention stations were located at Dodd Field on Fort Sam Houston (San Antonio) and Fort Bliss (El Paso).